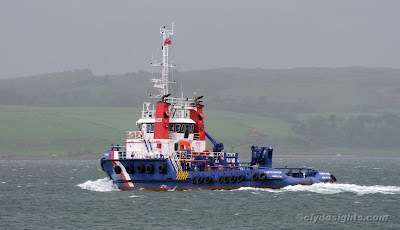 Also involved in the rescue off Largs was Briggs Marine's small anchor handling tug FORTH HUNTER. She was built in 2008 in the Far East by the Shin Yang Shipyard in Malaysia, and is 37 metres in length. She has a bollard pull of 35 tonnes, and is powered by two Cummins KTA38M2 engines driving twin screws. FORTH HUNTER was on the Clyde a few weeks ago undertaking survey work, but her most recent visit was to deliver a floating crane to Greenock.